Try Rotman Interactive Trader now! Simply follow the instructions on this page to install and run Rotman Interactive Trader. After installing the application, you will be able to connect to a special Rotman demonstration server running the case Liability Trading 3. Experience first hand the versatility of RIT!. Note: This RIT Demonstration Server is for demonstration purposes only. Schools may not use this server for classroom or lecture purposes. Follow the directions on the Downloads site to install the Rotman Interactive Trader client. Run the Rotman Interactive Trader Client by double clicking on your desktop icon or by navigating through your start menu. Read the End User License Agreement prompted on the screen and click Accept. Enter a unique Broker ID and password into the login dialogue box. 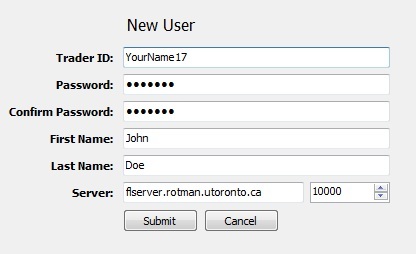 Then change the Server IP field to "flserver.rotman.utoronto.ca". Do not change the "10000" field. Click connect to connect to the RIT demonstration server. If another user has already created a login on the server using the same Broker ID as you, you will get an error “Invalid Broker ID/Password”. If that is the case, change your Broker ID to something different and login again. Otherwise, the system will prompt you “Broker ID does not exist, create new login?” Select Yes. The server will then prompt you to create a new user. Fill in the fields and click OK. Your Broker ID and Password have now been added to the RIT Demonstration Server user database. In the future, you can reuse the same Broker ID and password and bypass the "Create a New User" process. You are now ready to trade. The RIT Demonstration Server continuously runs the Liability Trading 3 case. Every 5 minutes when the case ends, the server resets the case and another iteration begins. Read the Liability Trading 3 case file here, or access the step-by-step trading tutorial here. Copyright © 2006-2018 Rotman School of Management | 105 St.George Street Toronto, ON.